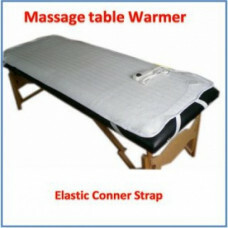 Product Code: Massage Table Warmer Pad- 30"X73"
As the long winter months loom ahead, massage therapists are looking for ways to add comfort and warmth to their massage sessions. OneTouch Massage has just the answer with their new fleece massage table heating pad. Add relaxing warmth to any massage table! One of the most common complaints heard by bodyworkers, especially when the client first gets into position on their massage table, is how cold the table's surface feels on the client's bare skin. This pad can rapidly eliminate that problem. This massage warming pads are 68 inches by 26 inches. Because it is comfortable and soft to the skin, it can be used during the massage, as well as before, to heat up the table's surface. One of the most common complaints heard by bodyworkers, especially when the client first gets into position on their massage table, is how cold the table's surface feels on the client's bare skin. This pad can rapidly eliminate that problem. This fleece warming pad is 68 inches by 26 inches. Because it is comfortable and soft to the skin, it can be used during the massage, or before the practice to heat up the massage table's surface. 1. Unfold and lay your warming pad flat on the table, strap side down. The controller and cord should hang down the head end of table. 2. To secure the warming pad to the table, slide each of the elastic straps around its respective corner of the table. 3. Remove and folds or bunching in the fleece warming pad before using it.